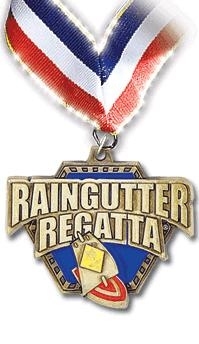 What is a Raingutter Regatta? Give a boy a balsa wood block and tell him to sand it, paint it, decorate it, and get ready to blow, blow, blow... and the fun race is on! Meanwhile the leaders assemble two ten foot long raingutters and fill them with water and it is an instant race course. The power in the boat is in the lungs of the scout! Currently there is no regatta scheduled, who wants to chair this event?